Galway Metals Intersects 14.5 g/t Au over 3.1m and 0.9 g/t Au over 35.2m in a Satellite Zone 5 Km West of Clarence Stream; Additional Strong Gold Anomalies Delineated - Galway Metals Inc.
Galway is also pleased to report additional strong gold-in-soil anomalies delineated along strike with North and South Zone resources, extending up to 12.0 km along strike from the South Zone western limit (Figure 2). On September 26, 2017, Galway issued a resource update at Clarence Stream, which now includes pit-constrained resources of 352,200 ounces of Measured and Indicated plus 153,100 ounces of Inferred, each at 1.9 g/t gold. The underground gold resource contains an additional 37,800 ounces at 4.4 g/t of Measured and Indicated plus 124,100 ounces at 4.5 g/t of Inferred (estimate prepared by SRK Consulting (U.S.), Inc.). Galway’s first two drill holes at Jubilee targeted the open west end of the zone, with the intersections located approximately 72 metres west of previous drilling by Jubilee Gold and Union Gold. Jubilee Gold and Union Gold conducted 3,436 metres of drilling in 20 holes on the property from 2001 to 2011, it did not issue a resource estimate. Their drilling did, however, return resource-grade intersections such as 10.1 g/t Au over 1.4 meters (within a broader interval containing 1.1 g/t Au over 23.9 meters) and 8.3 g/t Au over 1.4 meters (within 2.1 g/t Au over 8.5 meters). The zones were drilled to a vertical depth of 89 metres (11.3/0.5m) by previous operators. With the new results, a resource would cover approximately 270 metres of horizontal strike length. 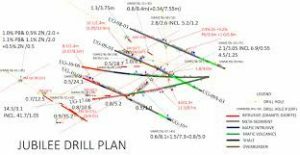 At least three horizons of mineralization covering a width of 85 metres appear to be present in the historical drilling, while another horizon has been intersected within the intrusion to the northwest, adding 60 metres for a total of 145 metres of width to the zone. True widths for all drill programs to date at Jubilee are unknown at this time. The two holes Galway is reporting herein were from the same set-up, and drilled northwest, with Hole 2 undercutting Hole 1 at a steeper angle. The vertical distance from the 0.9 g/t Au over 35.2 m in Hole 1 to the 0.8 g/t Au over 10.6 m in Hole 2 is approximately 15 metres. The vertical distance from the 0.7 g/t Au over 12.5 m in Hole 1 to the 14.5 g/t Au over 3.1 m in Hole 2 is approximately 23 metres. If they are the same zones, the zones may be dipping shallowly to the south as opposed to the steep north dip of the Clarence Stream South Zone. Overburden at this drill site is 2.0 metres vertical.Assays are pending for the remaining 9 holes and for the last half of the first two holes. 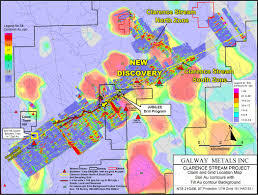 Resources at Clarence Stream are contained within 2.5-km of Galway’s 65-km strike length. Beyond the areas containing the resources, there are many additional strong drill targets identified that exhibit similarly coincident and highly anomalous glacial tills, soils, boulders and chip samples, along magnetic lows. Galway Metals has undertaken a very aggressive soil sampling program consisting of more than 10,000 samples in 2016 and 4,237 samples in 2017, located along 12 km of the Sawyer Brook Fault System, and from discreet areas located to the north of it. This sampling was undertaken to cover areas that contained high gold, arsenic, and bismuth glacial till samples that were previously taken by the New Brunswick and Canadian governments. Such strong till anomalies on/near the Clarence Stream deposit ultimately lead to its discovery.After the till anomalies were located, follow-up soil sampling led to the identification of drill targets, which resulted in the delineation of the North and South Zone resources. Many other similarly anomalous showings, however, remain untested by drilling. Previous operators, such as Freewest Resources, Wolfden Resources and Jubilee Gold also undertook extensive soil sampling. These samples were taken at 25 metre intervals along lines 100 metres apart. In Galway’s programs, similar sample intervals were used and some strong and laterally extensive anomalies have been delineated. One linear anomaly in particular stands out as it is in excess of 4 kilometers long. It is 7.5 km to 11.7 km along strike with Clarence Stream and 2.5 km to 6.7 km along strike with the Jubilee Zone, to the west of where holes GWM17BL-01 and 02 are located and are open in that direction. It contains 11 samples greater than 100 ppb gold, with the highest at 681 ppb. For comparison, 10 ppb is considered very anomalous. Also of note is a northwest-southeast trending wide anomalous zone located north of the North Zone that is on strike with it. The highest soil grade there is 540 ppb; the highest in the known North Zone area where the resource is located was 417 ppb. These anomalous soils cannot have come from the known North Zone gold resource area. This North grid anomalous area has dimensions of 1.7 km by 1.0 km, which is slightly larger than the known North Zone extent. Soil anomalies also extend 2.8 km to the southeast of the North Zone —also with no drilling having taken place. Almost all linear soil anomalies are located in magnetic low areas, on the flanks of magnetic highs, in the same pattern as seen in the North and South Zone resource areas at Clarence Stream. Two grids were covered in 2017 on either side of the Rollingdam grid that had returned the best results from 2016. The strongest till anomaly in southwestern New Brunswick is present directly east of the 2016 Rollingdam grid, with 95 ppb gold (versus 24 ppb at Clarence Steam that led to its discovery). Eight linear anomalies have been delineated, in this east zone, up to 1.1 km long. The highest-grade soil anomalies include 681 ppb plus 107 ppb (consecutive samples 25m apart), and 140 ppb in one zone, 164 ppb and 180 ppb in a second zone, and 231 ppb in another zone. To the west of the 2016 Rollingdam grid, eleven linear anomalies have been delineated, up to 1.4 km long. The highest-grade soil anomalies include 158 ppb, 180 ppb, and 281 ppb in one zone, 308 ppb and 523 ppb in a second zone, and 111 ppb, 154 ppb, and 104 ppb in other zones. The 2016 Rollingdam grid has seven linear anomalies delineated. Soil samples are the brown soils directly below the roots and other organic matter that contain chemically (and mechanically) concentrated gold and other elements, whereas till samples are located below the soils in glacial till (gravel) that contains gold and other elements that are mechanically transported by glaciers. The tills in the region are generally thin (1-5 metres) and are thought to have been transported short distances (generally less than 350 metres). On August 3, 2016, Galway reported that it had secured an Option Agreement to acquire a 100% interest in Clarence Stream, which is located 70 kilometres (km) south-southwest of Fredericton in south-western New Brunswick, Canada. Concurrently, Galway acquired the Jubilee (Birneys Lake) property at Clarence Stream for CDN$200,000 plus a 1% NSR royalty with a buyback option for half (0.5%) at any time for CDN$500,000. Galway would also like to acknowledge the financial support from the New Brunswick Junior Mining Assistance Program, which funded drilling at Jubilee. Note: true widths at Jubilee are unknown at this time. Clarence Stream is located along, and controlled by, the Sawyer Brook Fault boundary of the Gander and Avalon terranes of the Canadian Appalachians in Palaeozoic age intrusive and sedimentary rocks, which are the primary hosts of gold mineralization. The deposits are intrusion-related quartz-vein hosted fault-controlled gold with pyrite, base metal sulphides, and stibnite plus anomalous concentrations of bismuth, arsenic, antimony and tungsten, with sericitization and chloritization. Gold is present in two main areas—the South Zone along the Sawyer Brook Fault and the North Zone 3.5 km NW. The South Zone is steeply dipping, east-northeast trending, with two horizons identified to date, and multiple shoots extending over more than 2.5 km with the resource extending to a maximum depth of 336 metres to date along contacts and within sheared and altered metagabbro and microgranite sills and dikes that crosscut the meta-sedimentary rocks and are related to the Saint George Batholith to the south (presence of hornfels + veined and altered auriferous microgranite dikes + high concentrations of Bi, As and Sb). The North Zone consists of four lenses that appear to be part of the same shallow dipping horizon up to 37.4 metres thick within a one km by two km area to a maximum depth of 90 metres, and is hosted within metagreywacke and argillite, and in quartz veins with stringers and semi-massive stibnite, arsenopyrite, and pyrite. Michael Sutton, P.Geo., is the Qualified Person who supervised the preparation of the scientific and technical disclosure in this news release on behalf of Galway Metals Inc. All core, chip/boulder samples, and soil samples are assayed by Activation Laboratories, 41 Bittern Street, Ancaster, Ontario, Canada, who have ISO/IEC 17025 accreditation. All core is under watch from the drill site to the core processing facility. All samples are assayed for gold by Fire Assay, with gravimetric finish, and other elements assayed using ICP. The Company’s QA/QC program includes the regular insertion of blanks and standards into the sample shipments, as well as instructions for duplication. Standards, blanks and duplicates are inserted at one per 20 samples. Approximately five percent (5%) of the pulps and rejects are sent for check assaying at a second lab with the results averaged and intersections updated when received. Core recovery in the mineralized zones has averaged 99%. www.galwaymetalsinc.comCAUTIONARY STATEMENT: Neither the TSX Venture Exchange nor its Regulation Services Provider (as that term is defined in the policies of the TSX Venture Exchange) accepts responsibility for the adequacy of this news release. No stock exchange, securities commission or other regulatory authority has approved or disapproved the information contained herein. This news release contains forward-looking information which is not comprised of historical facts. Forward-looking information involves risks, uncertainties and other factors that could cause actual events, results, performance, prospects and opportunities to differ materially from those expressed or implied by such forward-looking information. Forward-looking information in this news release includes statements made herein with respect to, among other things, the Company’s objectives, goals or future plans, potential corporate and/or property acquisitions, exploration results, potential mineralization, exploration and mine development plans, timing of the commencement of operations, and estimates of market conditions. Factors that could cause actual results to differ materially from such forward-looking information include, but are not limited to, exploration results being less favourable than anticipated, capital and operating costs varying significantly from estimates, delays in obtaining or failures to obtain required governmental, environmental or other project approvals, political risks, uncertainties relating to the availability and costs of financing needed in the future, changes in equity markets, inflation, changes in exchange rates, fluctuations in commodity prices, delays in the development of projects, risks associated with the defence of legal proceedings and other risks involved in the mineral exploration and development industry, as well as those risks set out in the Company’s public disclosure documents filed on SEDAR. Although the Company believes that management’s assumptions used to develop the forward-looking information in this news release are reasonable, including that, among other things, the Company will be able to identify and execute on opportunities to acquire mineral properties, exploration results will be consistent with management’s expectations, financing will be available to the Company on favourable terms when required, commodity prices and foreign exchange rates will remain relatively stable, and the Company will be successful in the outcome of legal proceedings, undue reliance should not be placed on such information, which only applies as of the date of this news release, and no assurance can be given that such events will occur in the disclosed time frames or at all. The Company disclaims any intention or obligation to update or revise any forward-looking information contained herein, whether as a result of new information, future events or otherwise, except as required by applicable securities laws.